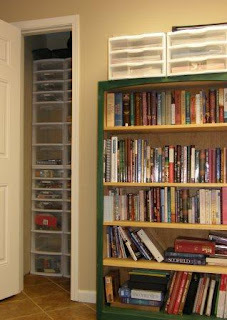 Craft Room Pics - what a beautiful thing! 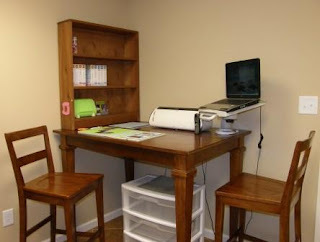 As many of your know...we recently went through a basement remodel, and as part of that process, I have a new dedicated crafting (ie embroidery & scrapbooking) room - I LOVE IT!!! Just wanted to post a few pics so that you could see my new space! This shows my bookcase with my 12x12 paper drawers on top - Brad has already checked it out and I can stack 2 more on top of these two if need be - can a girl really ever have too much paper?! You also get a partial shot of my closet storage. 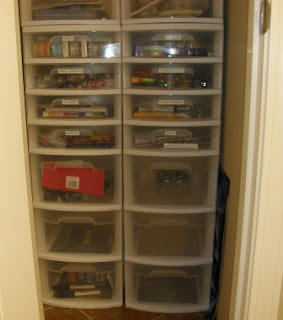 These are the bottom 2 of the 4 drawer stacks in my closet - so much great storage! 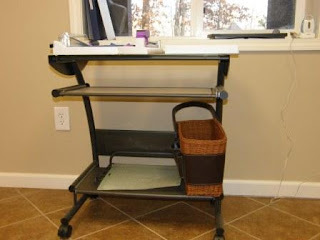 Each unit has 3 large drawers & 4 small drawers. We found these at Wal-Mart & they fit perfectly! This is an old computer desk that we weren't using any longer - I have my Purple Cow paper cutter sitting on top - it's great bc it rolls around the room, so I can roll it closer to my desk when I'm working. This is a great set-up for cropping! (Note the baby monitor on the window sill - that way I can work while my little bug is sleeping & not miss it when he wakes up!) 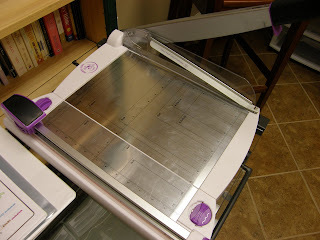 This is my purple cow papertrimmer - 2 trimmers in 1. 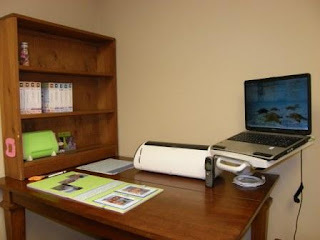 Here is my worktable area - I have a shelf to hold my cricut cartridges & other various goodies. There's a rolling cart under the table for other assorted goodies. A little closer shot. When Autumn (or anyone else) comes over to craft, the table also has a leaf, so we can pull it out and have even more space! Thanks for taking my little tour - hopefully we'll get all my sewing goodies downstairs in the next week or so - that will fill up a now empty corner, but I think will continue to make it a very pleasant room to work in!